Multiple Emmy and Golden Globe winner, and recipient of the Officer of the British Empire (OBE), Jane Seymour was honored with the annual Dream Big Award at Los Angeles Team Mentoring’s 20th annual Soiree celebration. Twenty-six years after the eruption of the L.A. riots, Los Angeles Team Mentoring (LATM), Los Angeles’ pioneering non-profit organization guiding middle school students from challenging urban neighborhoods to reach their full potential and develop their leadership skills, celebrated its anniversary at the gala, which was held on the evening of Thursday, October 25th at the Fairmont Miramar Hotel in Santa Monica. 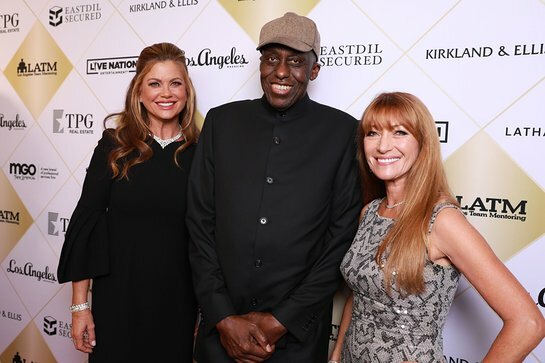 Supermodel-turned-supermogul, Kathy Ireland, last year’s honoree, was this year’s Honorary Chair and emcee. Guests included supermodel Ashley Graham, L.A. Rams cornerback Sam Shields, actor/director Bill Duke and actress Angelique Cabral. The evening raised over $825K. Also honored at Soiree this year was MGO, receiving the “Corporate Excellence Award” for being a strong supporter and advocate of gender equality and causes that promote the advancement of those in need. LATM’s annual Soiree is the organization’s signature fundraising event, which ensures over 330 volunteer mentors are able to provide critical mentoring services to over 1,300 at-risk youth for an entire school year. This year’s presenting sponsors Live Nation, TPG Real Estate, Eastdil Secured, Latham & Watkins and LATM Founder Darell Krasnoff were joined by Kirkland & Ellis, Keenan & Associates, Dolby, Banc of California, Goldman Sachs, Greenspoon Marder, Ernst & Young, Nickelodeon, Deluxe, Row8, and many more. Immediately in the wake of the 1992 civil unrest, Los Angeles Team Mentoring (LATM) launched its first after-school mentoring program at Horace Mann Middle School, located just three miles from the epicenter of the Los Angeles Riots. Its team-based mentoring model, developed by the Princeton Center for Leadership, was instituted to train and encourage that leadership, the benefits of which have long been helping to modify the effects of gang activity, violence, poverty and high drop-out rates of young people. Since its inception, the organization has impacted the lives of 26,000 young people through two and a half million hours of after school mentoring. The organization focuses on the critical non-school hours – after-school, weekends and summers – to ensure that students have a safe and structured programming and access to trusted adult role models. Youth enroll in LATM’s program in 6th, 7th and 8th grade. Although LATM does not provide tutoring, students in the program not only earn higher grades — but go on 4 years later to graduate at a 22% higher rate — in spite of 29% of those same students coming from homes where neither parent has graduated from high school. In addition, 100% of LATM youth have increased self-esteem — giving them the critical foundation they need to dream big and succeed at all things in life.